​Total Tickets on Device. The total number of tickets downloaded to the device for all selected events (designated beneath the total as either valid or invalid). Tickets Checked In. The total number of tickets currently scanned at all selected events (upon last sync). Scanned Locally. The total number of unique tickets scanned on this particular device. Waiting to Sync. The total number of unique tickets successfully scanned on this device that are not yet synced with the database. ​Last Sync. The most recent date and time at which a successful sync occurred. ​​Event ID. The system ID for the selected event. Total Tickets on Device. The total number of tickets downloaded to the device for the selected event (designated beneath the total as either valid or invalid). Tickets Checked In. The total number of unique tickets currently scanned at the selected event (upon last sync). Scanned Locally. The total number of tickets scanned for the selected event on this particular device. Waiting to Sync. 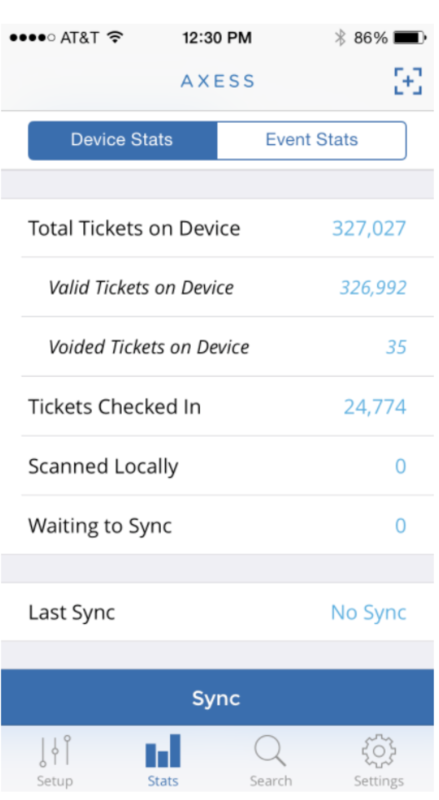 The total number of unique tickets successfully scanned for the selected event on this device which are not yet synced with the database.